This morning my friend Liz, at Liz's Paper Loft, posted a heartbreaking story about a first grade student of one her friends. Little Juliana was recently diagnosed with bone cancer, and doctors may have to amputate one of her legs. If you're interested in making a card for Juliana, head over to Liz's blog. 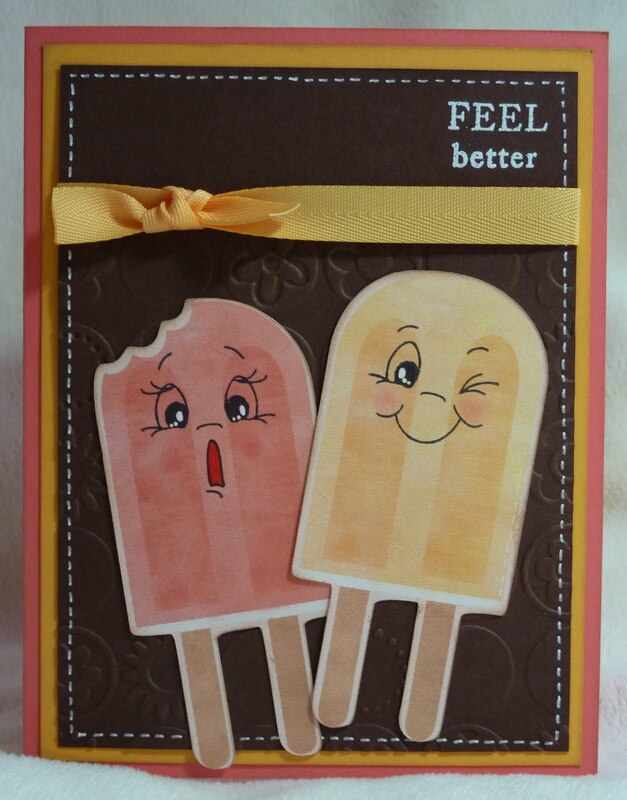 I love the popsicles cut from the Imagine Yummy cartridge, and I thought they would make a fun get well card for Juliana. I cut the popsicles in layers at 3.8". I am entering this card in Peachy Keen's "Let's Face it Friday Sew Super Cute Challenge," where we needed to include real or faux stitching and some cute Peachy Keen faces. I hope it brings a smile to Juliana's face! 8 1/2" x 5 1/2" Papertrey Ink Berry Sorbet Cardstock, scored at 4 1/4"
This is adorable. I love the faces on the popsicles, sooo fitting. Great Job! Thank You Katie for directing me to the C.C.I Challenge... I just left this site not to long ago and you already posted another card! I agree with Mary... this is so perfect for little Julianna! Love the colors, the dry and heat embossing and also that you used your Imagine! As always love all your creations! Katie, this card is adorable. Julianna will love it. I am always impressed with your attention to details! Love it! What a heartbreaking story. She is in my prayers. This card will bring a smile to her face, I'm sure. katie, thank you for making her a card! I know that she will love it! I'm hoping I can deliver a bunch to her! I love your card. It is so thoughtful. I am sure that she will smile when she receives it. that story is heart breaking :( but your card is awesome and I know will brighten the little girls day. :) Thanks for sharing. Super cute Katie! You did a great job, thanks for playing with us at PKS LFIF!